This is the same yarn I used for my hat a while back, so this was actually using up some left over yarn. 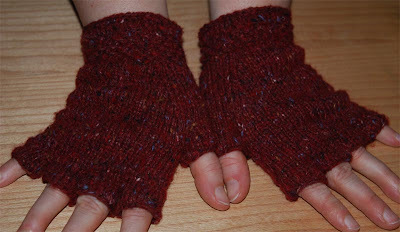 The pattern is 'Knucks' from Knitty, though I left out the stitching. I do love them and they are surprisingly warm. I did some more knitting (some simply socks, about 70% done) and also stitched some on the Game Board Sampler, but nothing too exciting, so no photos for now. I wrangled it into the frame last Saturday and am fairly happy with it. It's maybe a smidgen too small, but considering that I don't exactly have fabric to spare on the left hand side, it's okay. Now, I've already decided where it's going to be hanged, but that means a) I will have to take of the pic already there and b) I'll have to nail in two new nails. I'm still fairly distracted by the Twilight saga. I've finished the last book last weekend (I think it's the weakest in the lot, but that's mostly because how some things developed. I still breezed through it) Now I've immersed myself into the fanfiction, giving my old e-book a good work out. Some really, really good stuff, some less so, but that's fanfiction for you. If the story is crap there's always the famous delete button. 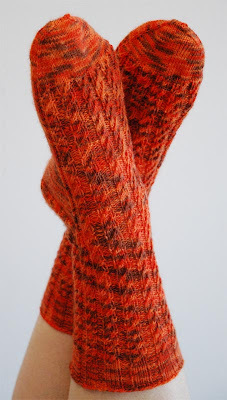 Despite the distraction, my first pair of socks for 2009 has been finished. Some cheapy yarn I've picked up in Dresden last year and the cross rib pattern from the favorite socks book. Love how the colors pool. The orange does pop, that's for sure. I'm also back on the Sampler Game Board, after I've sorted out a little color problem I've had. 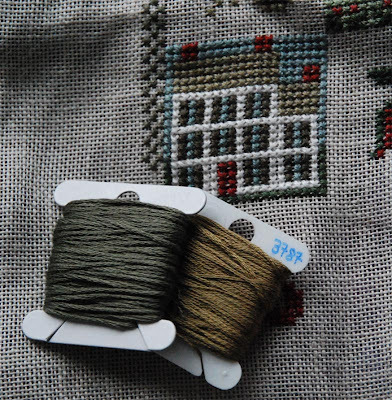 The bobbin on the right is what I took of a new skein of 3787 and it should have been the same color as the border. Well, obviously something was incorrectly labeled, as the 'real' 3787 is the one on the left. My thanks goes to a very good friend, who helped me out quickly after I realized the problem, so I could work on. Last August, when I visited my sister in Sweden, I think I might have dropped a supple hint that I wouldn't mind too much if she would make me a quilt. 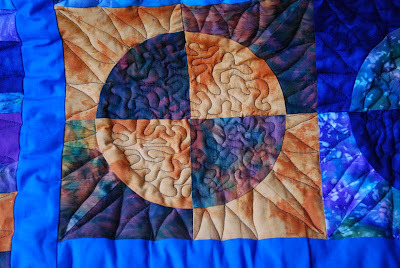 My very own quilt. All for me! Mine! 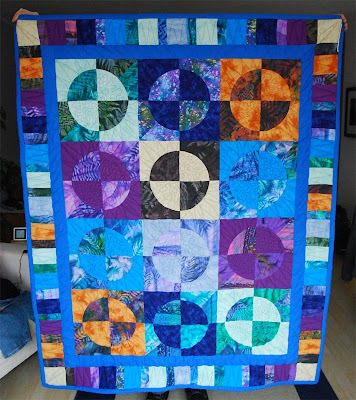 This quilt is pretty damn cool. Size is 47 x 59 inches (120cm by 150cm) and the perfect size to snuggle in on my sofa and read a good book.